Enjoy the triple-threat power of the Injury Relief Kit. A great way to support and promote fast, natural healing. We have put our Trilogy of Healing gels All-in-one kit! There is no better natural alternative to harmful chemicals and antibiotics! This all-natural approach to a happy and healthy body consists of our Wound Relief™, Bruise, Strain and Tear Repair™ and our Muscle Honey™. Cleanse & apply this soothing gel for a speedy recovery. Clean the surface, and apply this soothing gel to improve your recovery, naturally! Every household should have a tube of Wound Relief™ in the medicine cabinet. If you have any kind of skin irritation or damage this gel is the perfect answer and the first thing you should be reaching for. Our special Wound Relief™ blend offers a barrier against dirt and germs, along with the aloe vera to soothe and promote healing. At Nature’s Rite we keep all of our products as natural as we can, that is why our gels are a great alternative to antibiotics and other drug options. Next time you’re looking for instant soothing & relief, grab some Wound Relief™. Put the irritation to rest once and for all! This non-menthol, non-greasy and fast absorbing gel is the greatest breakthrough in sports medicine. This gel improves the body’s ability to repair injuries. What makes this product great is it’s not smelly or greasy (many other similar products carry an odor). The Bruise Strain & Tear Repair offers a great natural relief to the affected area. The Bruise, Strain and Tear Repair™ helps the body’s ability to relax muscle fibers to eliminate residual trauma; it also stimulates the body’s ability of tissue regeneration for healthier and faster repairs. Bruise, Strain and Tear Repair™ extends the repair to make it complete. When you’re in need of a non-prescription, and safe topical gel, the Bruise, Strain and Tear Repair™ is a must. Work Hard! Play Harder! Recover Faster! Hurt Less! Athletes rely on this herbal blend to promote recovery & to reach peak performance. Take performance to the next level with Muscle Honey™. This is a new day in Herbal Sports Enhancement! With this water-decoction of numerous herbal ingredients has been traditionally used for centuries by hunters, runners and laborers to achieve real results. Just rub into your muscles and it will help the body’s ability to improve muscle performance, reduce the pain of competition and achieve a faster & better recovery time! Everyone benefits from the Injury Repair Kit! There is no excuse. From children to grandparents and athletes to gardeners! 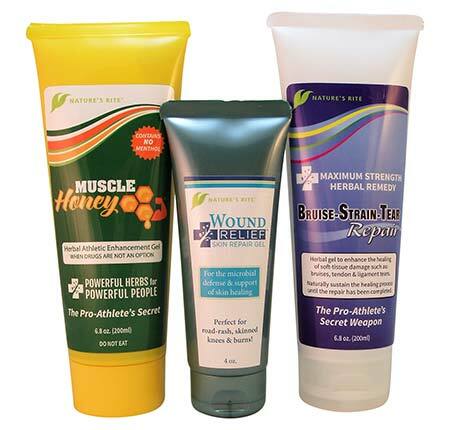 With the Injury Repair Kit™, save $5.00 when combined with all three.